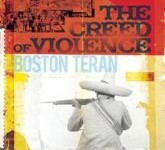 "The Creed of Violence" is a father-son redemption story set in the West. It is based on the unpublished novel was written by Boston Teran. The story, set in 1910, revolves around an estranged father and son trying to thwart an arms smuggling ring bringing weapons to Mexico.